If you are tired of touristy places but you would like to admire the beauty of Halong bay, Bai Tu Long bay, join us today on Red Dragon Cruise. Discover the untouched area of the bay. Visit the local fishing villages. You rarely see other crowded tourist groups. 19:00 Have dinner and overnight on board the Red Dragon. 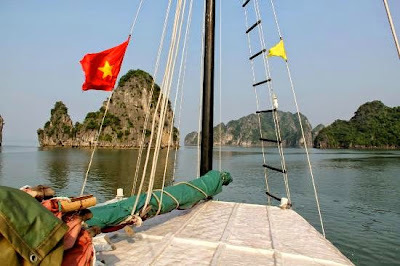 Day 2: Bai Tu Long Bay cruising- Hanoi ( Breakfast / Lunch). 08:30 Visit Vung Vieng fishing village by a rustic row-boat, meet the local people and pass through the floating school and fish farms. 09:30 More time for swimming in the middle of the bay. 10:00 Start cruising towards the harbor while an A la carte lunch is served. After that you will transfer to Hanoi. Arrive in Hanoi. Trip ends. First Choice hopes to serve you next time! 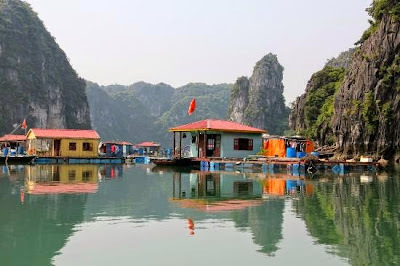 This off the beaten track cruise to Bai Tu Long Bay can be on the Prince Junk, Princess Junk. We now have 2 different itineraries for low season and high season. So, contact Red Dragon Cruise for details. - Charter rate: for a private tour, rent the whole crewed boat. Please contact us for a private boat.